This article is about the Holy See of Rome. For other uses, see Holy See (disambiguation). It has been suggested that Temporal power (papal) be merged into this article. (Discuss) Proposed since September 2018. Every see is considered holy. In Greek, the adjective "holy" or "sacred" (ἱερά transliterated as hiera) is constantly applied to all such sees as a matter of course. In the West, the adjective is not commonly added, but it does form part of an official title of two sees: besides the Diocese of Rome ("the Holy See"), the Bishopric of Mainz (the former Archbishopric of Mainz, which was also of electoral and primatial rank) bears the title of "the Holy See of Mainz" (Latin: Sancta Sedes Moguntina). 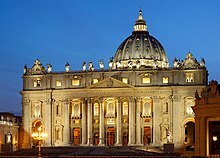 The apostolic see of Rome was established in the 1st century by Saint Peter ("Prince of the Apostles") and Saint Paul, then the capital of the Roman Empire, according to Catholic tradition. The legal status of the Catholic Church and its property was recognised by the Edict of Milan in 313 by Roman Emperor Constantine the Great, and it became the state church of the Roman Empire by the Edict of Thessalonica in 380. After the Fall of the Western Roman Empire in 476, the temporal legal jurisdisction of the Papal primacy was further recognised as promulgated in Canon law. The Holy See was granted territory in Duchy of Rome by the Donation of Sutri in 728 of King Liutprand of the Lombards, and sovereignty by the Donation of Pepin in 756 by King Pepin of the Franks. The Papal States held extensive territory and armed forces in 756–1870. Pope Leo III crowned Charlemagne as Roman Emperor by translatio imperii in 800. The Papal coronations of the emperors of the Holy Roman Empire from 858 and the Dictatus papae in 1075 mark the peak of the pope's temporal power claims. Several contemporary states still trace their own sovereignty to recognition in medieval Papal bulls. Sovereignty of the Holy See was retained despite multiple sacks of Rome during the Early Middle Ages. Yet, relations with the Kingdom of Italy and the Holy Roman Empire were at times strained, reaching from the Diploma Ottonianum and Libellus de imperatoria potestate in urbe Roma regarding the "Patrimony of Saint Peter" in the 10th century, to the Investiture Controversy in 1076-1122, and settled again by the Concordat of Worms in 1122. The exiled Avignon Papacy during 1309-1376 also put a strain on the Papacy, which was however finally returned to Rome. Pope Innocent X was critical of the Peace of Westphalia in 1648 as it weakened the authority of the Holy See throughout much of Europe. Following the French Revolution, the Papal States briefly were occupied as the "Roman Republic" from 1798 to 1799 as a sister republic of the First French Empire under Napoleon, before their territory was reestablished. Notwithstanding, the Holy See was represented in and identified as a "permanent subject of general customary international law vis-à-vis all states" in the Congress of Vienna of 1814 to 1815. The Papal States were recognised under the rule of the Papacy and largely restored to their former extent. Despite the Capture of Rome in 1870 by the Kingdom of Italy and the Roman Question during the Savoyard era (which made the Pope a "prisoner in the Vatican" from 1870 to 1929), its international legal subject was "constituted by the ongoing reciprocity of diplomatic relationships" that not only were maintained but multiplied. The Lateran Treaty in 11 February 1929 between the Holy See and Italy recognised the Vatican City as an independent city-state, along with extraterritorial properties around the region. The Holy See is one of the last remaining seven absolute monarchies in the world, along with Saudi Arabia, Swaziland, United Arab Emirates, Qatar, Brunei, and Oman. 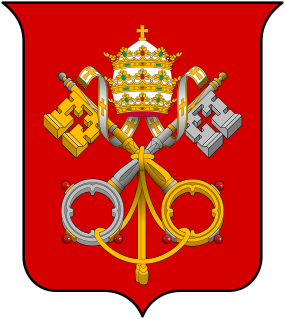 The Pope governs the Catholic Church through the Roman Curia. The Roman Curia consists of a complex of offices that administer church affairs at the highest level, including the Secretariat of State, nine Congregations, three Tribunals, eleven Pontifical Councils, and seven Pontifical Commissions. The Secretariat of State, under the Cardinal Secretary of State, directs and coordinates the Curia. The incumbent, Cardinal Pietro Parolin, is the See's equivalent of a prime minister. Archbishop Paul Gallagher, Secretary of the Section for Relations with States of the Secretariat of State, acts as the Holy See's minister of foreign affairs. Parolin was named in his role by Pope Francis on 31 August 2013. The Secretariat of State is the only body of the Curia that is situated within Vatican City. The others are in buildings in different parts of Rome that have extraterritorial rights similar to those of embassies. Three tribunals exercise judicial power. The Roman Rota handles normal judicial appeals, the most numerous being those that concern alleged nullity of marriage. The Apostolic Signatura is the supreme appellate and administrative court concerning decisions even of the Roman Rota and administrative decisions of ecclesiastical superiors (bishops and superiors of religious institutes), such as closing a parish or removing someone from office. It also oversees the work of other ecclesiastical tribunals at all levels. The Apostolic Penitentiary deals not with external judgments or decrees, but with matters of conscience, granting absolutions from censures, dispensations, commutations, validations, condonations, and other favors; it also grants indulgences. The Holy See does not dissolve upon a Pope's death or resignation. It instead operates under a different set of laws sede vacante. During this interregnum, the heads of the dicasteries of the Roman Curia (such as the prefects of congregations) cease immediately to hold office, the only exceptions being the Major Penitentiary, who continues his important role regarding absolutions and dispensations, and the Camerlengo of the Holy Roman Church, who administers the temporalities (i.e., properties and finances) of the See of St. Peter during this period. The government of the See, and therefore of the Catholic Church, then falls to the College of Cardinals. Canon law prohibits the College and the Camerlengo from introducing any innovations or novelties in the government of the Church during this period. In 2001, the Holy See had a revenue of 422.098 billion Italian lire (about US$202 million at the time), and a net income of 17.720 billion Italian lire (about US$8 million). According to an article by David Leigh in the Guardian newspaper, a 2012 report from the Council of Europe identified the value of a section of the Vatican's property assets as an amount in excess of €680m (£570m); as of January 2013, Paolo Mennini, a papal official in Rome, manages this portion of the Holy See's assets—consisting of British investments, other European holdings and a currency trading arm. The Guardian newspaper described Mennini and his role in the following manner: "... Paolo Mennini, who is in effect the pope's merchant banker. Mennini heads a special unit inside the Vatican called the extraordinary division of APSA – Amministrazione del Patrimonio della Sede Apostolica – which handles the "patrimony of the Holy See"." The Orders, decorations, and medals of the Holy See are conferred by the Pope as temporal sovereign and fons honorum of the Holy See, similar to the orders awarded by other heads of state. The Holy See has been recognized, both in state practice and in the writing of modern legal scholars, as a subject of public international law, with rights and duties analogous to those of States. Although the Holy See, as distinct from the Vatican City State, does not fulfill the long-established criteria in international law of statehood—having a permanent population, a defined territory, a stable government and the capacity to enter into relations with other states—its possession of full legal personality in international law is shown by the fact that it maintains diplomatic relations with 180 states, that it is a member-state in various intergovernmental international organizations, and that it is: "respected by the international community of sovereign States and treated as a subject of international law having the capacity to engage in diplomatic relations and to enter into binding agreements with one, several, or many states under international law that are largely geared to establish and preserving peace in the world." Foreign relations with the Holy See. Since medieval times the episcopal see of Rome has been recognized as a sovereign entity. The Holy See (not the State of Vatican City) maintains formal diplomatic relations with and for the most recent establishment of diplomatic relations with 183 sovereign states, and also with the European Union, and the Sovereign Military Order of Malta, as well as having relations of a special character with the Palestine Liberation Organization; 69 of the diplomatic missions accredited to the Holy See are situated in Rome. The Holy See maintains 180 permanent diplomatic missions abroad, of which 74 are non-residential, so that many of its 106 concrete missions are accredited to two or more countries or international organizations. The diplomatic activities of the Holy See are directed by the Secretariat of State (headed by the Cardinal Secretary of State), through the Section for Relations with States. There are 15 internationally recognized states with which the Holy See does not have relations. The Holy See is the only European subject of international law that has diplomatic relations with the government of the Republic of China (usually known as Taiwan) as representing China, rather than the government of the People's Republic of China (see Holy See–Taiwan relations). The British Foreign and Commonwealth Office speaks of Vatican City as the "capital" of the Holy See, although it compares the legal personality of the Holy See to that of the Crown in Christian monarchies and declares that the Holy See and the state of Vatican City are two international identities. It also distinguishes between the employees of the Holy See (2,750 working in the Roman Curia with another 333 working in the Holy See's diplomatic missions abroad) and the 1,909 employees of the Vatican City State. The British Ambassador to the Holy See uses more precise language, saying that the Holy See "is not the same as the Vatican City State. … (It) is the universal government of the Catholic Church and operates from the Vatican City State." This agrees exactly with the expression used by the website of the United States Department of State, in giving information on both the Holy See and the Vatican City State: it too says that the Holy See "operates from the Vatican City State". The Holy See is a member of various International organizations and groups including the International Atomic Energy Agency (IAEA), International Telecommunication Union, the Organization for Security and Co-operation in Europe (OSCE), the Organisation for the Prohibition of Chemical Weapons (OPCW) and the United Nations High Commissioner for Refugees (UNHCR). The Holy See is also a permanent observer in various international organizations, including the United Nations General Assembly, the Council of Europe, UNESCO (United Nations Educational, Scientific and Cultural Organization), the World Trade Organization (WTO), and the Food and Agriculture Organization (FAO). The Holy See participates as an observer to African Union, Arab League, Council of Europe, Organization of American States, International Organization for Migration, and in the United Nations and its agencies FAO, ILO, UNCTAD, UNEP, UNESCO, UN-HABITAT, UNHCR, UNIDO, UNWTO, WFP, WHO, WIPO. It participates as a guest in the Non-Aligned Movement (NAM), and as a full member in IAEA, OPCW, Organization for Security and Co-operation in Europe (OSCE). Although the Holy See is closely associated with the Vatican City, the independent territory over which the Holy See is sovereign, the two entities are separate and distinct. After the Italian seizure of the Papal States in 1870, the Holy See had no territorial sovereignty. In spite of some uncertainty among jurists as to whether it could continue to act as an independent personality in international matters, the Holy See continued in fact to exercise the right to send and receive diplomatic representatives, maintaining relations with states that included the major powers Russia, Prussia and Austria-Hungary. Where, in accordance with the decision of the 1815 Congress of Vienna, the Nuncio was not only a member of the Diplomatic Corps but its dean, this arrangement continued to be accepted by the other ambassadors. In the course of the 59 years during which the Holy See held no territorial sovereignty, the number of states that had diplomatic relations with it, which had been reduced to 16, actually increased to 29. The State of the Vatican City was created by the Lateran Treaty in 1929 to "ensure the absolute and visible independence of the Holy See" and "to guarantee to it an indisputable sovereignty in international affairs." Archbishop Jean-Louis Tauran, the Holy See's former Secretary for Relations with States, said that the Vatican City is a "minuscule support-state that guarantees the spiritual freedom of the Pope with the minimum territory". The Holy See, not the Vatican City, maintains diplomatic relations with states. Foreign embassies are accredited to the Holy See, not to the Vatican City, and it is the Holy See that establishes treaties and concordats with other sovereign entities. When necessary, the Holy See will enter a treaty on behalf of the Vatican City. Though, like various European powers, earlier Popes recruited Swiss mercenaries as part of an army, the Pontifical Swiss Guard was founded by Pope Julius II on 22 January 1506 as the personal bodyguards of the Pope and continues to fulfill that function. It is listed in the Annuario Pontificio under "Holy See", not under "State of Vatican City". At the end of 2005, the Guard had 134 members. Recruitment is arranged by a special agreement between the Holy See and Switzerland. All recruits must be Catholic, unmarried males with Swiss citizenship who have completed their basic training with the Swiss Armed Forces with certificates of good conduct, be between the ages of 19 and 30, and be at least 175 cm (5 ft 9 in) in height. Members are armed with small arms and the traditional halberd (also called the Swiss voulge), and trained in bodyguarding tactics. The police force within Vatican City, known as the Corps of Gendarmerie of Vatican City, belongs to the city state, not to the Holy See. The difference between the two coats of arms is that the arms of the Holy See have the gold key in bend and the silver key in bend sinister (as in the sede vacante coat of arms and in the external ornaments of the papal coats of arms of individual popes), while the reversed arrangement of the keys was chosen for the arms of the newly founded Vatican City State in 1929. 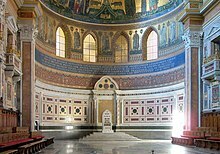 ^ Although Saint John Lateran is legally within Rome, Italy, it is one of the properties of the Holy See granted extraterritorial privileges. ^ "About the Holy See". ^ a b "CIA's factbook Vatican State". ^ Robbers, Gerhard (2006) Encyclopedia of World Constitutions. Infobase Publishing. ISBN 978-0-81606078-8. p. 1009. ^ "Code of Canon Law: text - IntraText CT". ^ "CATHOLIC ENCYCLOPEDIA: St. Peter, Prince of the Apostles". ^ Kersting, Hans (2003). MAINZ - tours on foot. 4. Bayerische Verlagsanstalt. ISBN 978-3-89889-078-6. ^ "'Moral Diplomacy' of the Holy See: Multi-Level Diplomacy of a Transnational Actor". ^ "State and Government". www.vaticanstate.va. Retrieved 1 April 2018. ^ "These 7 nations are ruled by an absolute monarchy!". Stories of World. 22 December 2015. Retrieved 1 April 2018. ^ Code of Canon Law, canons 1443–1444 Archived 8 January 2010 at the Wayback Machine. Vatican.va. Retrieved on 11 September 2011. ^ Code of Canon Law, canon 1445 Archived 8 January 2010 at the Wayback Machine. Vatican.va. Retrieved on 11 September 2011. ^ ''Pastor bonus'', articles 117–120 Archived 23 February 2001 at the Wayback Machine. The Vatican. (28 June 1988). Retrieved on 11 September 2011. ^ David Leigh (21 January 2013). "How the Vatican built a secret property empire using Mussolini's millions". The Guardian. Retrieved 23 January 2013. ^ These criteria for statehood were first authoritatively enunciated at the Montevideo Convention on Rights and Duties of States, signed by American states on 26 December 1933. ^ a b "Bilateral and Multilateral Relations of the Holy See, update on October 22, 2009". Archived from the original on 9 July 2014. ^ Robert Araujo and John Lucal, Papal Diplomacy and the Quest for Peace, the Vatican and International Organizations from the early years to the League of Nations, Sapienza Press (2004), ISBN 1-932589-01-5, p. 16. See also James Crawford, The Creation of States in International Law, (1979) p. 154. ^ Bilateral and Multilateral Relations of the Holy See Archived 12 October 2010 at the Wayback Machine. The Vatican. (31 May 2007). Retrieved on 11 September 2011. ^ "179 states have full diplomatic relations with the Holy See". Zenit News Agency. 11 January 2012. Archived from the original on 16 January 2012. Retrieved 20 January 2012. ^ Afghanistan, Bhutan, Brunei, Comoros, Laos, the Maldives, North Korea, Oman, the People's Republic of China, Saudi Arabia, Somalia, Tuvalu and Vietnam. See: "Mission Impossible: Eject the Holy See from the United Nations". chiesa:News, analysis, and documents on the Catholic Church, by Sandro Magister. 21 August 2007. Retrieved 3 October 2007. ^ Background Note: Holy See. State.gov (8 March 2011). Retrieved on 11 September 2011. ^ Lecture by Archbishop Giovanni Lajolo, 16 February 2006. 30giorni.it. Retrieved on 11 September 2011. ^ Lecture by Archbishop Jean-Louis Tauran, 22 April 2002 Archived 15 February 2014 at the Wayback Machine. Vatican.va. Retrieved on 11 September 2011. ^ Bilateral and Multilateral Relations of the Holy See Archived 9 July 2014 at the Wayback Machine. Vatican.va. Retrieved on 11 September 2011. ^ "Päpstliche Schweizergarde: 1506 Foundation". 30 October 2013. Archived from the original on 30 October 2013. ^ "Päpstliche Schweizergarde: Conditions". 21 April 2013. ^ "The golden key, which points upwards on the dexter side, signifies the power that extends even to Heaven. The silver key, which must point up to the sinister side, symbolizes the power over all the faithful on earth." Bruno Bernhard Heim, Heraldry in the Catholic Church: Its Origin, Customs and Laws (Van Duren 1978 ISBN 9780391008731), p. 54. ^ "Appendix B ("All. B. Stemma Ufficiale dello Stato della Città del Vaticano") of the Fundamental Law of Vatican City State, 7 June 1929" (PDF). Köck, Heribert F. (1975). Die Völkerrechtliche Stellung Des Heiligen Stuhls: Dargestellt an Seiner Beziehungen Zu Staaten Und Internationalen Organisationen. Berlin: Duncker und Humblot. ISBN 978-3-428-03355-3. Köck, Heribert F. (1995). "Holy See". In Bernhardt, Rudolf; Macalister-Smith, Peter (eds.). Max Planck Encyclopedia of Public International Law. 2. Amsterdam: North-Holland. ISBN 978-0-444-86245-7. La Due, William J. (1999). The Chair of Saint Peter: A History of the Papacy. Maryknoll, N.Y: Orbis Books. ISBN 978-1-57075-249-0. Wikimedia Commons has media related to Holy See. Look up holy see in Wiktionary, the free dictionary. The Holy See has long been recognised as a subject of international law and as an active participant in international relations. One observer has stated that its interaction with the world has, in the period since World War II, been at its highest level ever. It is distinct from the city-state of the Vatican City, over which the Holy See has "full ownership, exclusive dominion, and sovereign authority and jurisdiction". Although the Roman Catholic Church has been territorially established in Canada since the founding of New France in the early 17th century, Holy See–Canada relations were only officially established during the pontificate of Pope Paul VI in 1969. The history of the Roman Curia, the administrative apparatus responsible for managing the affairs of the Holy See and the Catholic Church, can be traced to the 11th century when informal methods of administration began to take on a more organized structure and eventual a bureaucratic form. The Curia has undergone a series of renewals and reforms, including a major overhaul following the loss of the Papal States, which fundamentally altered the range and nature of the Curia's responsibilities, removing many of an entirely secular nature. The legal status of the Holy See, the ecclesiastical jurisdiction of the Catholic Church in Rome, both in state practice and according to the writing of modern legal scholars, is that of a full subject of public international law, with rights and duties analogous to those of States.